What if you had a $100 gift card to the music store of your choice, what would you buy?? I don’t know. I honestly don’t know. We have just about all the music we want, between us. That said, I could put at least some of it to good use on sheet music; I’d love to have The Girl with the Flaxen Hair, by Claude Debussy, and it would just be interesting to have the score of Rachmaninoff’s Second Piano Concerto and/or Second Symphony on hand so I could follow along when listening. Otherwise, I’m drawing a complete blank, at the moment. I think that finding out that yet more snow is on the way has just put a cap on my mental processes; I’m going to have some chocolate ice cream, and then have dinner, and then curl up with my cross stitch and Law & Order on the TV, and vegetate till spring. Jim’s out of town till tomorrow, so at least I don’t have to cook for him. And a good thing, too, in my current state. So How Do You Actually Work This? 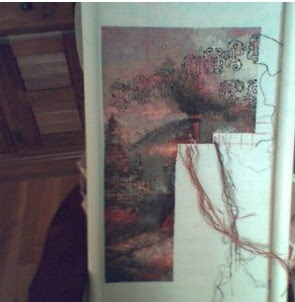 I seem to be getting myself in deeper and deeper — Suzanne was wondering how I keep track of all those different colors. This is an earlier photo that shows it best. First, you grid. 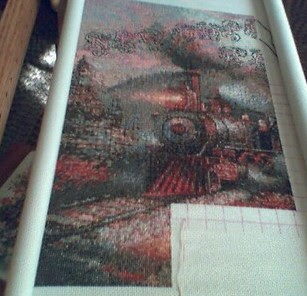 Some people actually have the patience to stitch a 10 x 10 grid onto their fabric. 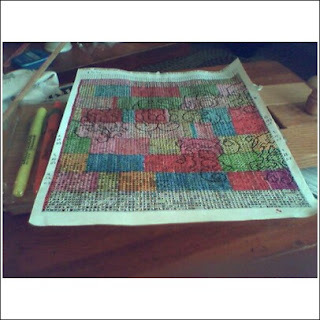 I don’t; I work the first ten stitches in any given row, then use a washable dress-pattern marker to plot the grids. And as you can see from this photo, I only do the grid I’m working on, and leave little “tails” of marker at the end so that when I’m finished with that grid, I can lay out the next grid and know that it will be 10 x 10. Having done that, I am also fanatical about marking off each row of ten stitches as I work it. I really would go crazy otherwise. And the final thing I do to keep track of all the colors and threads — and the reason I chose this photo — is that I “park” stitches. I only work ten stitches at a time, straight down the row. Sometimes a row will contain as few as three colors, other times, every single stitch is a different color. When I work a stitch, I look ahead in that row to see where the color will occur next, and bring the needle up in that stitch. If it won’t occur again in that row, I look ahead to the next row, and if I see that color symbol in the next row, I’ll bring the needle up in that stitch and “park” the thread there until it’s needed again. If it doesn’t occur in the next row, I’ll scan the entire grid to see where it shows up next. Sometimes it doesn’t occur again until much later in the project, and in that case, I do finish off the thread and wrap the leftover around the skein of floss, where it stays until I need it again. I finish off using something called a “pinhead stitch”: Since cross-stitch fabric consists of little holes, you can bring the thread up in between two holes — crosswise or lengthwise, according to the weave of the fabric — and push the needle back down smack in the middle of the little square. Then you bring it back up on the other side of where you’ve made your “pinhead,” and push it back down in the middle of the little square again. Then you pull it tightly. Once you get the hang of it, you can actually make the pinhead stitch nearly invisible, because it buries itself in the middle of the square. Suzanne was noting that she didn’t know how shading could be accomplished with threads, so I thought I’d attach a photo of what one of these charts looks like. The different colors of markers on this chart are an invention of mine so that I would know how much I got done on any given day. Purple is Sunday, Yellow is Monday, Orange is Tuesday, Blue is Wednesday, Red is Thursday, Green is Friday, Pink is Saturday. It doesn’t show very clearly, but each of those black blobs at the bottom — the unmarked portion of the chart — is a different symbol, and each symbol represents a floss color. The largest manufacturer of flosses, DMC, has a range of close to 4,000 colors; I’ve never seen a project with all 4,000 colors (egad), but the blend of all those colors is how you get that painterly effect. I forgot to mention that this Saturday, my church is starting up a needlework group for the ladies of the parish — women have been invited to bring their knitting or embroidery, and the idea is just to carve a space out of the month (first Saturday of each month) to get together and make time to work on projects, and hopefully, make some new friends in the parish. I bet I will be the only one to show up for a few months, though I might be surprised. Someone was kind enough to ask about my progress on my latest cross-stitch project. So here it is. In terms of being the “latest” project, actually, it’s one of the older ones — I’ve been saying I started it in 2004, but I looked at all my progress photos and I actually started it in 2005 — anyway, it’s been around long enough, and it’s Time to finish it, by Christmas, I hope. So this is my focus piece for the year. I have 40 more rows to go, and it will be 40% completed. I am learning so much about art composition from working this piece — it intrigues me, for example, how the color rises at an angle, and how very many different colors go into just one 10 x 10 section. At any given time, I can have as many as 40 floss bobbins available to work with. And I had a sweet note from my priest — I had sent him a clip from Fr. John Whiteford’s blog about Holy Trinity Monastery in Jordanville, and he responded, “What a wonderful town! We really should organize a trip there!” He has no idea just how wonderful Jordanville is. (If you click on the clip on Father John’s blog, you do have to slog through about 4 minutes of trivia about Jordanville before you get to the “main event,” the monastery.) Any time I see photos of the church, it’s like looking at photos of an old and greatly beloved home. Poor Father Costin, by the way, has come down with chicken pox. His older daughter brought it home from school, and about two weeks ago we were talking about it and he said, “Oh, yes, I have had chicken pox. I think I have had chicken pox.” And right then, I knew he hadn’t. Well, he’s got it now. He still plans to be in church on Saturday for the First Saturday of Souls, but I told him not to come if he is feeling the least bit tired — this isn’t anything to play games with. Why do kids think they’re indestructible!!! What a winter it’s been, one snow storm after another since December. Normally, we don’t get much snow in December at all — we might have a dusting in time for Christmas — this season, we had a good foot on the ground by Christmas, and it has continued unabated ever since. Today is just the latest storm, and it’s particularly irksome, since dh is travelling in it. Yes, the Powers That Be in Good Ol’ DC decreed that Travel Must Go Forward, regardless of the probability of snow and travel delays, so this past week, dh has been in (of all places) Philadelphia. Our son lived in the Philly area for 2 1/2 years, and not once did my husband have travel in that area. Now that Chris has been home for a year, where does his father have to travel?! Go figure. Having left the City of Brotherly Love at, what, 8:30 a.m.? — he just walked in the door at 8:45 p.m. Sound miraculous? Not if you took the train, as dh did. He hates airline travel so much that he will actually wrestle with Defense Travel Service to get train travel approved — as it turns out, it’s a good thing he did, this time, since all the airports are closed and flights from elsewhere are delayed up the yinyang. But Amtrak made it through with, I think, only half an hour’s delay. And if they had gotten stuck, at least he could have stretched out in his seat to sleep, not have had to make do with sleeping in a )@(#*$&%^! airport. The worst part of the trip was getting from the train station to the house, because he had to wait for a cab for 45 minutes — I do not drive, in this weather. But there’s a cafe about two blocks from the train station, and he sat it out very happily, till the cabbie showed up and brought him home. So all’s well that ends well. But I am still ticked off. When dh was working for the Navy, they did not travel in the winter, period. Army, apparently, does not believe in such civility. Am I correct in my belief that Navy consistently wins the Army/Navy Football Game?? Meanwhile, there’s a few inches of the white stuff out there — six or so — with more to come. Everyone I know is ready to hang the groundhog. Even me, and normally I love winter. I stopped loving it, this year, around mid-January. Come on, Mother Nature, February’s almost over. We need at least a little warmth — flowers, no, it’s way too early for flowers, but a modification of air temperature, anyway. And less — much less — of the white stuff, thankyouverymuch.